In a lab 18 feet below the Engineering Quad of Stanford University, researchers in the Dionne lab camped out with one of the most advanced microscopes in the world to capture an unimaginably small reaction. The lab members conducted arduous experiments — sometimes requiring a continuous 30 hours of work — to capture real-time, dynamic visualizations of atoms that could someday help our phone batteries last longer and our electric vehicles go farther on a single charge. Toiling underground in the tunneled labs, they recorded atoms moving in and out of nanoparticles less than 100 nanometers in size, with a resolution approaching 1 nanometer. Their experiments focused on hydrogen moving into palladium, a class of reactions known as an intercalation-driven phase transition. This reaction is physically analogous to how ions flow through a battery or fuel cell during charging and discharging. Observing this process in real time provides insight into why nanoparticles make better electrodes than bulk materials and fits into Dionne’s larger interest in energy storage devices that can charge faster, hold more energy and stave off permanent failure. For these experiments, the Dionne lab created palladium nanocubes, a form of nanoparticle, that ranged in size from about 15 to 80 nanometers, and then placed them in a hydrogen gas environment within an electron microscope. The researchers knew that hydrogen would change both the dimensions of the lattice and the electronic properties of the nanoparticle. They thought that, with the appropriate microscope lens and aperture configuration, techniques called scanning transmission electron microscopy and electron energy loss spectroscopy might show hydrogen uptake in real time. After months of trial and error, the results were extremely detailed, real-time videos of the changes in the particle as hydrogen was introduced. The entire process was so complicated and novel that the first time it worked, the lab didn’t even have the video software running, leading them to capture their first movie success on a smartphone. Following these videos, they examined the nanocubes during intermediate stages of hydrogenation using a second technique in the microscope, called dark-field imaging, which relies on scattered electrons. In order to pause the hydrogenation process, the researchers plunged the nanocubes into an ice bath of liquid nitrogen mid-reaction, dropping their temperature to 100 degrees Kelvin (-280 F). These dark-field images served as a way to check that the application of the electron beam hadn’t influenced the previous observations and allowed the researchers to see detailed structural changes during the reaction. While most electron microscopes operate with the specimen held in a vacuum, the microscope used for this research has the advanced ability to allow the researchers to introduce liquids or gases to their specimen. Aside from being a widely applicable proof of concept for this suite of visualization techniques, watching the atoms move provides greater validation for the high hopes many scientists have for nanoparticle energy storage technologies. The researchers saw the atoms move in through the corners of the nanocube and observed the formation of various imperfections within the particle as hydrogen moved within it. This sounds like an argument against the promise of nanoparticles but that’s because it’s not the whole story. The researchers describe this as imperfections being “pushed out” of the nanoparticle. This ability of the nanocube to self-heal makes it more durable, a key property needed for energy storage materials that can sustain many charge and discharge cycles. As the efficiency of renewable energy generation increases, the need for higher quality energy storage is more pressing than ever. It’s likely that the future of storage will rely on new chemistries and the findings of this research, including the microscopy techniques the researchers refined along the way, will apply to nearly any solution in those categories. For its part, the Dionne lab has many directions it can go from here. The team could look at a variety of material compositions, or compare how the sizes and shapes of nanoparticles affect the way they work, and, soon, take advantage of new upgrades to their microscope to study light-driven reactions. At present, Hayee has moved on to experimenting with nanorods, which have more surface area for the ions to move through, promising potentially even faster kinetics. This entry was posted in electronics, energy, nanotechnology and tagged & Jennifer A. Dionne, Ai Leen Koh, Andrea Baldi, batteries, dark-field imaging, Direct visualization of hydrogen absorption dynamics in individual palladium nanoparticles, electrodes, electron energy loss spectroscopy, energy storage devices, Fariah Hayee, ghost-of-the-joystick problem, hydrogenation, Jen Dionne, nanoparticles, palladium nanocubes, renewable energy generation, Robert Sinclair, scanning transmission electron microscopy, self-healing, Stanford University, Tarun C. Narayan, Tarun Narayan, Taylor Kubota, visualization techniques on February 1, 2017 by Maryse de la Giroday. The electrodes for connections on the “sunny side” of a solar cell need to be not just electrically conductive, but transparent as well. As a result, electrodes are currently made either by using thin strips of silver in the form of a coarse-meshed grid squeegeed onto a surface, or by applying a transparent layer of electrically conductive indium tin oxide (ITO) compound. Neither of these are ideal solutions, however. This is because silver is a precious metal and relatively expensive, and silver particles with nanoscale dimensions oxidise particularly rapidly; meanwhile, indium is one of the rarest elements on earth crust and probably will only continue to be available for a few more years. Manuela Göbelt on the team of Prof. Silke Christiansen has now developed an elegant new solution using only a fraction of the silver and entirely devoid of indium to produce a technologically intriguing electrode. The doctoral student initially made a suspension of silver nanowires in ethanol using wet-chemistry techniques. She then transferred this suspension with a pipette onto a substrate, in this case a silicon solar cell. As the solvent is evaporated, the silver nanowires organise themselves into a loose mesh that remains transparent, yet dense enough to form uninterrupted current paths. Subsequently, Göbelt used an atomic layer deposition technique to gradually apply a coating of a highly doped wide bandgap semiconductor known as AZO. AZO consists of zinc oxide that is doped with aluminium. It is much less expensive than ITO and just as transparent, but not quite as electrically conductive. This process caused tiny AZO crystals to form on the silver nanowires, enveloped them completely, and finally filled in the interstices. The silver nanowires, measuring about 120 nanometres in diameter, were covered with a layer of about 100 nanometres of AZO and encapsulated by this process. Measurements of the electrical conductivity showed that the newly developed composite electrode is comparable to a conventional silver grid electrode. However, its performance depends on how well the nanowires are interconnected, which is a function of the wire lengths and the concentration of silver nanowires in the suspension. The scientists were able to specify the degree of networking in advance with computers. Using specially developed image analysis algorithms, they could evaluate images taken with a scanning electron microscope and predict the electrical conductivity of the electrodes from them. “We are investigating where a given continuous conductive path of nanowires is interrupted to see where the network is not yet optimum”, explains Ralf Keding. Even with high-performance computers, it still initially took nearly five days to calculate a good “quality map” of the electrode. The software is now being optimised to reduce the computation time. “The image analysis has given us valuable clues about where we need to concentrate our efforts to increase the performance of the electrode, such as increased networking to improve areas of poor coverage by changing the wire lengths or the wire concentration in solution”, says Göbelt. “We have developed a practical, cost-effective alternative to conventional screen-printed grid electrodes and to the common ITO type that is threatened however by material bottlenecks”, says Christiansen, who heads the Institute of Nanoarchitectures for Energy Conversion at HZB and additionally directs a project team at the Max Planck Institute for the Science of Light (MPL). This entry was posted in electronics, energy, nanotechnology and tagged atomic layer deposition technique, AZO (zinc oxide doped with aluminium) transparent electronics, Björn Hoffmann, electrical conductivity, electrodes, Encapsulation of silver nanowire networks by atomic layer deposition for indium-free transparent electrodes, Erdmann Spiecker, Germany, Helmholtz Zentrum Berlin, Helmholtz-Zentrum Berlin für Materialien und Energie, indium tin oxide (ITO) compound, Manuela Göbelt, Michael Latzel, need to be not just electrically conductive, plasmonic effects, Ralf Keding, Sara Jäckle, Sebastian W. Schmitt, Silke Christiansen, silver nanoparticles, silver nanowires, solar cells, Velimir R. Radmilović, Vuk V. Radmilović on August 10, 2015 by Maryse de la Giroday. Just how bendy are the new organic semiconductors? A revolution is coming in flexible electronic technologies as cheaper, more flexible, organic transistors come on the scene to replace expensive, rigid, silicone-based semiconductors, but not enough is known about how bending in these new thin-film electronic devices will affect their performance, say materials scientists at the University of Massachusetts Amherst. They are the first to apply inhomogeneous deformations, that is strain, to the conducting channel of an organic transistor and to understand the observed effects, says Reyes-Martinez [Marcos Reyes-Martinez], who conducted the series of experiments as part of his doctoral work. This entry was posted in electronics, nanotechnology and tagged Alejandro L. Briseno, Alfred J. Crosby, bendable electronics, bending, crystalline semiconductorcalled rubrene, electrodes, flexible electronics, Marcos A. Reyes-Martinez, rubrene, Rubrene crystal field-effect mobility modulation via conducting channel wrinkling, semiconductors, University of Massachusetts at Amherst, wrinkling on May 12, 2015 by Maryse de la Giroday. A team of researchers from Lawrence Livermore and UC Davis have found that covering an implantable neural electrode with nanoporous gold could eliminate the risk of scar tissue forming over the electrode’s surface. The team demonstrated that the nanostructure of nanoporous gold achieves close physical coupling of neurons by maintaining a high neuron-to-astrocyte surface coverage ratio. Close physical coupling between neurons and the electrode plays a crucial role in recording fidelity of neural electrical activity. Neural interfaces (e.g., implantable electrodes or multiple-electrode arrays) have emerged as transformative tools to monitor and modify neural electrophysiology, both for fundamental studies of the nervous system, and to diagnose and treat neurological disorders. These interfaces require low electrical impedance to reduce background noise and close electrode-neuron coupling for enhanced recording fidelity. Designing neural interfaces that maintain close physical coupling of neurons to an electrode surface remains a major challenge for both implantable and in vitro neural recording electrode arrays. An important obstacle in maintaining robust neuron-electrode coupling is the encapsulation of the electrode by scar tissue. Typically, low-impedance nanostructured electrode coatings rely on chemical cues from pharmaceuticals or surface-immobilized peptides to suppress glial scar tissue formation over the electrode surface, which is an obstacle to reliable neuron−electrode coupling. However, the team found that nanoporous gold, produced by an alloy corrosion process, is a promising candidate to reduce scar tissue formation on the electrode surface solely through topography by taking advantage of its tunable length scale. “Our results show that nanoporous gold topography, not surface chemistry, reduces astrocyte surface coverage,” said Monika Biener, one of the LLNL authors of the paper. Nanoporous gold has attracted significant interest for its use in electrochemical sensors, catalytic platforms, fundamental structure−property studies at the nanoscale and tunable drug release. It also features high effective surface area, tunable pore size, well-defined conjugate chemistry, high electrical conductivity and compatibility with traditional fabrication techniques. The image depicts a neuronal network growing on a novel nanotextured gold electrode coating. The topographical cues presented by the coating preferentially favor spreading of neurons as opposed to scar tissue. 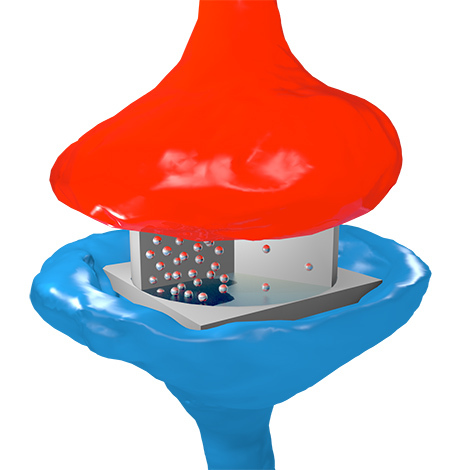 This feature has the potential to enhance the performance of neural interfaces. Image by Ryan Chen/LLNL. This entry was posted in medicine, nanotechnology and tagged Christopher A. R. Chapman, electrodes, Erkin Seker, Hao Chen, Juergen Biener, Lawrence Livermore National Laboratory, LLNL, Marianna Stamou, Monika M. Biener, nanoporous gold, Nanoporous Gold as a Neural Interface Coating: Effects of Topography Surface Chemistry and Feature Size, neuronal electrode, neurons, Pamela J. Lein, Ryan Chen, scarring, scars, Surface Chemistry, UC Davis, University of California at Davis on May 7, 2015 by Maryse de la Giroday.